Over the years I've made it my personal mission to get to know every designer consignment shop in London, worth knowing at least. Back in the days of making next to nothing as an intern, I could barely afford Topshop, let alone eye up a new designer dress or bag. Wasn't in the budget. It was either eat or shop, and, well, you guys know how I love a cheeseburger. So, I found ways to work around it. I left the idea of new designer items and instead decided on purchasing pre-loved pieces that were a fraction of the price. I could get my "designer hit" and no one would know the difference. London designer consignment stores were my dirty secret. My first buy was a Donna Karan runway dress for £65 in Hampstead. I officially had the fever. I needed a dress for a big event at my work and I was wearing one of the best gowns on the night and paid about 1/100th the price of what others in attendance were wearing. Seriously, why weren't other women doing this? Women in rich parts of the city were emptying their closets into these designer consignment shops and weren't even that bothered about the return on their investment. They were just spring cleaning and leaving it at that. I was ready to swoop in, at every chance, and grab what I could when I could. So here's the thing - the fever never really died. About once a month I still visit three London designer consignment stores that have given me endless pleasure. And as I made the pilgrimage to my favorite consignment shop in Hampstead last weekend, I did think, "why the hell haven't I been more giving with my readers with this information?" Well, here's the simple and short answer - I was greedy. I didn't want you guys all rushing in there and stealing from my treasure chest. That was in the beginning at least. But, I've taken such great pleasure, over the last few months, in introducing my dear friends to these haunts, that I thought it high time to share them with you too. So, in no particular order, here are my three favorite London designer consignment stores. Never have I managed to pop in without popping out the front door with something new (to me at least) in hand. Be prepared to hunt here as the rails are close together and the shoes and jewellery are all locked away in glass cabinets. But, my goodness, if you have the spare time, it's worth the rummage. I've had friends score Manolos here for £45, Mulberry bags for £85 and YSL jewellery for as low as £35. If you are into designer dresses you'll be in love in this London designer consignment store. This was my first London designer consignment shop visit. I was introduced to it from a friend who told me that all the actresses in the area were regular "dumpers" here. They'd leave bags of unwanted Chanel, Louis Vuitton, Gucci and more. Hundreds of handbags hang from the ceiling, suspended over racks and racks of preowned Chanel, Alexander McQueen, Ralph Lauren, Pucci and more. Basically name a designer and you'll find a piece here ripe and ready for the re-wearing. This is an establishment that is near and dear to my heart as I have absolutely fallen in love with the owner over the years. And trust me, being friends has its perks. For example, she knows exactly my size and also knows there's a body double out there who has a serious style addiction that matches my own (and a budget to live it out in real designer time). Every time I come in she points me in the direction of the body double's new deliveries and I end up spending way more money than I ever intended to part with. Chanel bags here have been discovered and purchased for as little as £110, DVF dresses have been found for £65 and Prada dresses for next to nothing. It should be criminal how much you are saving here. 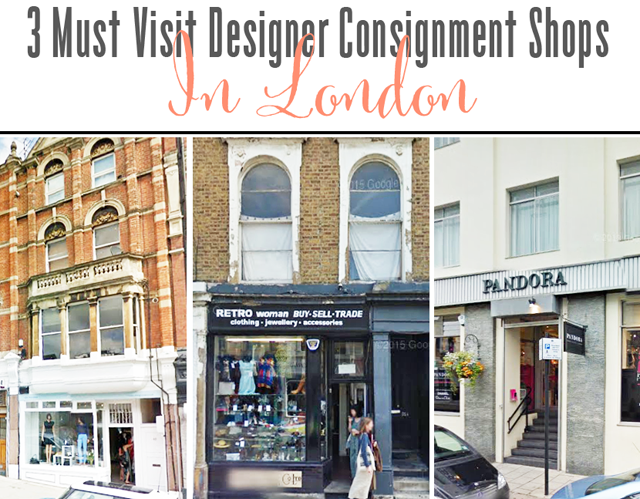 In short, it's a must visit London designer consignment shop. That's the be all and end all. They're scattered, but not so far and wide that you can't hit all the designer consignment shops listed in the course of one day. Tell them FFG sent you. Trust me, they all know me and know I have a serious addiction that requires treatment they pray I never seek out. Dear bank manager, now you know.